A distinguished, robust blend of Nicaraguan and Dominican tobaccos are hidden beneath a top quality Connecticut Broadleaf wrapper that makes this full bodied Churchill a pleasure to smoke. Packaged in a box of 25. 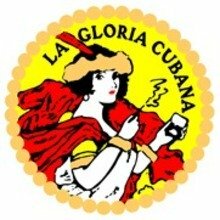 La Gloria Cubana church hill is definitely greatness all rolled up. Nice spicy start and even spicier finish. Sharp burn and high consistency in quality and flavor in every cigar. The Creamy luscious Island tobacco mixed with the stronger Central American leaf, and topped with a real Connecticut Maduro wrapper is both aromatic and delicious! Pretty good cigar. Nice distinct flavors with a very grassy smell. 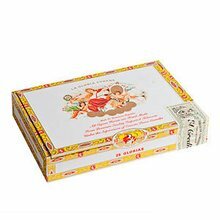 I've only had one so I'm not sure how consistent they are but I've tried a few others of the brand and they seem to be constructed fairly well. Nice smoke. Nice blend nice construction nice flavor nice draw. What else can I say? Another LGC that is a great smoke. It's a big cigar so put some time aside for it. Earthy and pepper flavors. Great construction. Bold taste and great construction are the hallmarks of this classic cigar. This is a nice long smoke. Draw is what you expect from this first rate company. 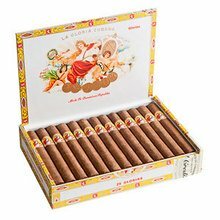 Whats not to love about La Gloria? They are constructed great. They have wonderful flavor and aroma. The draw is perfect. I'm entirely pleased with my selection. Beautiful cigar with fantastic qualities. The draw was great and the flavore were as well! Great cigar to smoke when your sitting around with your friends and drinking a cocktail. A plesant smoke, smooth robust and mildly peppery. I smoked a little quicker than I should have and it took about an hour and a half. Great stick! The flavor was excellent and consistent throughout the cigars I have smoked so far but I had a couple develop runners. It is hard to beat La Gloria overall.